Pristigenys serrula (Gilbert 1891), the Popeye Catalufa. Eastern Pacific; Monterey to Peru. To thirteen inches in length. 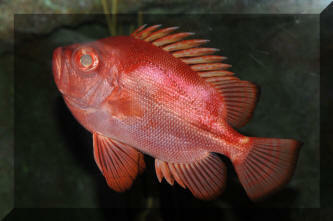 Nocturnal, hides during the day as the Cardinalfishes, Squirrelfishes. This one at the Denver Aquarium, Colorado. I stumbled on to your site, http://www.wetwebmedia.com, and I love the stuff you put out and must congratulate you on that! Are you currently offering guest post services? If so, one of our professional writers within the pet niche would love to draft up a blog post for you to share on your site. value to the guest post we would love that! Let me know what you think! Would love to see if we can partner and both benefit! Wanted to let you know I ended up getting a Gold Spotted Rabbitfish instead. It's been in QT and I have been feeding this fish the Dictyota from my display. Literally devours it in seconds. I am a bit concerned though about the potential to eat coral. From my research and readings it seems like this specific fish tends to be a Zoanthid eater. Any experience around leather corals, clams, etc? Is this fish really more prone to eating coral then some of the other rabbits? Just to pass more info. I manage to help him. Flukes were responsible for the sickness. That has not entirely been my experience, Bob. What they gain in adaptability, they seem to lose in exposure to Pleistophora. My avowed preference is for wild-caught Cardinals, isolated from Neons at all points, and maintained in soft to moderately soft, more or less acidic to neutral water chemistry. If medium hardness (or more so) water is inescapable, there are much better options: Pristella maxillaris, False Penguin Tetras, and Emperor Tetras. All these handle medium to hard water well. Do also rate the old-timey Cherry Barb as an excellent Southeast Asian alternative. I did attempt to try first by reading many threads of questions on this but haven't been able to pinpoint an answer so I'm sorry to have to bother you with another question. I have a 40-gallon breeder saltwater sumpless system that I have been running for about two years. I want to switch the sand out as it is in the "no man's land" category of around 3"deep. It is also a little larger than what is recommended for nitrate reduction. I have the sugar-fine grade coming next week. I have been struggling with too much algae so far. Hair algae, diatoms, cyanobacteria, the works. I have two hang-on skimmers and a hang-on refugium. These have been helpful along with weekly water changes but not good enough. I am suspecting my sand has been a detritus trap as I also have not been stirring the sand at all for water changes. So, question is, I have an empty 20-gallon tank with a 20-gallon sump that I could use to temporarily house my livestock while I empty the 40 and replace the sand. Will that be ok? Will it re-cycle when I add the new sand to the 40 and put the old water and livestock back in the 40? I am also waffling on the new sand depth. I was thinking either 1/2" or 4". But it's only a 40-gallon tank. I think larger tanks can absorb 4"of sand better than smaller tanks. (Aesthetically) What do you think? Thanks so much for your invaluable input. Thanks for your advice from a couple of weeks ago. I have completed cycling my tank but am currently having some further issues with my tank's pH. I would appreciate your advice. pH: about 7.3-7.8 after standing/aeration. I have noticed the tap pH has increased in the last couple of days, perhaps the water company is adding something to the water. No detectable hardness on my test kit. pH similar to the tap water. pH: 7.8-8.0 in the morning and up to 8.2-8.5 in the evening before the lights dim. The tank is fully cycled but uninhabited. It does however contain a few Cryptocorynes and a bundle of something that I think is Elodea that I have left to float on the surface. These have been in the tank for a week and a half and the Elodea in particular has taken off - some of the roots that have grown from the stems have grown so fast that they have actually reached the substrate and anchored themselves! I was aware it is a fast grower but it is astounding to see how vigorous it is in reality! The issue I am having is the elevated pH, despite using 50/50 RO/tap water as you suggested. I had initially set the alkalinity to 9dKH with additional baking soda but when I noticed the high pH I stopped this and have now only used the RO/tap mix for water changes. This has not lowered the pH although as expected the alkalinity is half that of the tap water. As you may remember, I had planned to keep cardinal tetras (captive bred) so I had the LFS test their system water. They report Ca/Mg at 5 dGH and alkalinity at 5 dGH, but their pH is 6.9-7.2 despite their using a 50/50 RO/tap mix as well. Our tap water is unlikely to be much different as the distance separating us is less than 5mi so I am unsure why there should be such a large difference. I can only think it is because either the LFS system contains a large amount of organic acids due to their bioload (they don't use peat); there is something in my water produced by the plants/algae/bogwood that is alkaline in nature; or my plants deplete the CO2 in my tank water faster than it replenishes at night (or all three). In any case, I am not sure what to do now. <Well, one approach would be avoid using plants that grow too rapidly, particularly those capable of remove carbonate and bicarbonate from the system. So reduce the amount of Elodea, and Vallisneria if you use them. Of course removing plants means algae can take over, so I'd suggest at least some floating plants that use CO2 from the air but minerals from the water. I am not keen to forcibly adjust the pH with acid or buffer and I also want to avoid a CO2 system because it is a lot of work and I don't think I am ready for that. I guess peat filtration might be an option but I am also reluctant to do this as I understand this is hard to control, will deplete the alkalinity, and the water staining may impact my plant growth. Do you have any other suggestions for lowering the pH, or should I just leave it alone and focus on keeping the alkalinity stable? If I am unable to lower the pH significantly, should I abandon my plan to keep Cardinals? I haven't been able to find much on whether they can be kept in water with this particular chemistry (low/medium hardness and alkalinity but high pH) and I don't want to force my fish to live in conditions that will make them unhappy or stressed. If you have any other suggestions for similar shoaling fish that would be happier in these tank conditions then I would also be grateful for those. Many thanks for your time and advice. Yes i hope so also. I've been trying to give it food small bits of scallops. Got it. Thanks for the help on ID and will follow up after research. Also, smaller files. Bob, hope you are enjoying Mexico! I read up on WWM’s resources on internal Hexamita, particularly in marine fish, as well as on metronidazole and other treatments for that malady. (Incidentally, it was your urging of others on WWM that led me to break out my 8yo daughter’s microscope to look at fish poo—good family time, honestly). So I have distilled this, and would appreciate your thoughts on it and whether anything further can be done. - Metronidazole in food, since the fish eats a little bit. I’ve discontinued putting it in the water for that reason. - Epsom salt. Added 1 tsp/gallon. Will scrutinize any resultant productions by the fish under the microscope (see family time above). - Pristine water. I am using a 1 gal container for the QT. Am assuming the small size is ok since the gramma is lethargic. Put a PVC tee fitting in to give it a place to hang out. I replace it every day with water from my DT, so it’s what the fish has always been used to. Aerate and temp control. - Watching it. A lot. Maybe staring at the fish will cause the Hexamita to die. I don’t know. Thanks for answering my question - and so quickly! From your answer, it sounds like it could be for many reasons, so I'll continue to monitor. Who knows, maybe a few more months is all they need - or maybe she's secretly a male. She's definitely an odd fish - I got her and she was completely gold without spots. Now she has almost as many spots as the red-spotted male! It would be great to see them successfully spawn - so thanks for all the advice. Ironically, she's the one harassing the male. All things considered, I'm not too concerned as long everyone's getting along. Hope you are doing fine. Thank you for maintaining this excellent site, a great help to us hobbyists. Question: One of my 6 Diamond Tetras have started swimming erratically since yesterday. They are established fish, in the tank for almost 2 years. There is no bloating, no injury marks, no loss of sparkle, no excess mucus and all the fins are intact. It just kind of topples over or at times fall sideways, try to regain posture and the cycle repeats. Tank is heavily planted 29 gallon, in its 8th year. No Ammonia or Nitrite, Nitrate 25. Filtered by three 500l/hr HOB filters filled with sponge, bio balls and ceramic media. Also a small bag each of Seachem Purigen and Carbon. Another pump works a chiller. pH 7.6, TDS 300ish. Tank mates include other tetras, Pencilfishes, Corydoras, BNP, Ram cichlids, all other fishes looking absolutely fine. 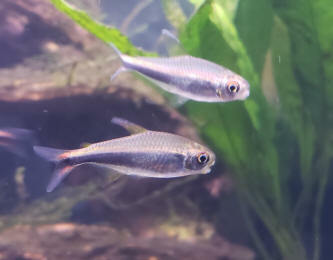 Points worth mentioning: I had a sudden surprise attack of Ich after years, 2 weeks after I introduced some Cardinal Tetras which themselves had no visible spots and were claimed to be quarantined by a reputed seller I have dealt with in the past. The spots affected only some Green Neons. I went the high temp way and allowed the tank to reach 31 C over the last 5 days. The spots are almost gone now. No fish is showing any signs of Oxygen hunger, no gasping at the surface, there is good circulation and surface agitation. I usually maintain the tank at 25.5-27.5 degrees C with a chiller (this is an Indian summer). I fed freeze dried Tubifex worms yesterday, which I do rarely. Else their diet is from various flakes and pellets from Tetra,, Ocean Nutrition and Hikari. I added the regular weekly dose of Seachem Flourish comprehensive and Flourish Iron yesterday, a practice I have followed for years. I also add 5 ml of a DIY macro mix every other day as per the recipe from James's Planted Tank. No use of paint fumes, aerosols, pesticides, etc. near tank. I have made a 40% water change today but no improvement in conditions. I replenished my dried Almond leaves 5 days ago, these are self collected. Or some kind other neurological issue? Do I euthanize in case it is contagious? Thanks in advance and keep well. Unfortunately the affected fish passed away last night. I isolated it after mailing to you. Rest are fine as of now. On my travels the other day I found an amazing group of dwarf snakeheads (Chana brakanhensis or something- photo included below for ID purposes). It was a group of 6 and I think this would make an amazing breeding project. Currently the only tank I have with room that would accommodate this group has a 10 inch silver Arowana and a 9 inch Xingu bass. I am very attached to those 2 fish and don’t want them to move on. Will I be able to add the snakeheads to this tank? They are fully grown between 6 and 8 inches. If this is a no-no, on a side point, is there anything else you can recommend for this tank? Could I keep a florida gar with the Aro and bass? things, but I did use large forceps to feed it bits of fish periodically. and excess mucus. Fahaka puffer got something else. It is looking like a bit rough skin then just turns into white patch. He is not eating and fins are clamped. What I saw is that excess mucus is made on him and today he was near surface but not gasping for air just standing there (doesn't look he is struggling to be there). After 2h he is down laying as before. and now started treatment with API general cure (metro and Prazi) because I think it may be flukes. Water is ammo 0, nitrite 0 and nitrate < 10. Tank has continual water replacement (slow drip system) with a lot of bio filtration. I suspect on a new fish being added 2 weeks ago. Any help is really appreciated. We don't have veterinarian for fish in Serbia and this fish is really dear to me. If you need more info just push one email and I will answer asap. (such as freshwater puffers) to brackish water for extended periods. Thanks a lot for your reply. I will try to see what can be done further more. My long tentacle anemone finally came out of hiding.! Thank you for the advise. Hi! I was searching through the forums and did learn a lot about tanks and even picked up some info on the type of tank I recently picked up which is the AGA 150g (72x18x28). The fellow I picked it up from, just finished resealing it using RTV103. He did a great job on the seams, which all seems uniform without glass touching glass - the thickness of the silicone seam is about the thin width of a tie-wrap. The final measurement on the top of the tank, which is square all around is 72x18-1/16. I do not have the original top frame. My understanding is that this tank came with a 4 piece top frame that did not include any bracing. It also looks like PO chipped some of the glass removing the top frame, I understand these frames were on there pretty good. The fact that the top now measures 18-1/16 across has made it impossible to find a plastic frame that will fit. I did find two retailers that sell these types of frames but one retailer told me the tank had to be exactly 18 and no bigger. The second retailer told me that the inside measurement was 18-1/4. It might be possible that this larger frame would fit, but I am waiting for clarification from the retailer - I may be able to modify it by cutting the inner rim if there is one and using more silicone, but we will have to see. A call to AGA, now Aqueon, says these frames are not available and that is also what they told my LFS. doesn't seem to be doing much at all except floating the glass bottom, but its not in the greatest condition as it isn't completely square on measurement (frame isn't square but tank is). This is my budget tank and I'm really not looking to do a big investment because I plan on buying a new ~300g tank after we remodel the living room. guess like a half-baked version of euro-bracing. Thoughts on the 3/8 or 1/2 bracing? Thoughts on modifying the plastic frame to fit? very well right now and I dread having to remove it for any purpose. My LFS has found Chelonodon patoca on an import list with 17 available at £10.99 each. Great result. They’re going in a 5 foot by 2 foot that I’m going to slowly make brackish. At that sort of size tank - how many should I go for? 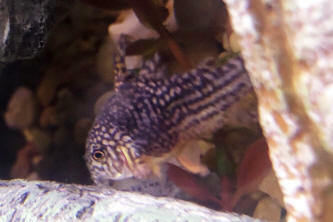 I have a Corydoras that looks like it has multiple tumors. There are more around its topside and one on a fin. 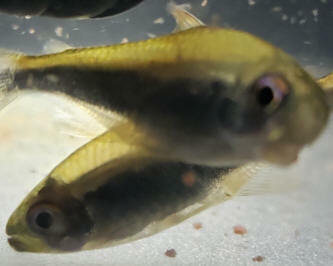 Some of the Cory's fins are split, but there are no fungus-like films growing and it is eating and swimming normally. All my other fish seem fine, even my ghost shrimp. Thanks for your help! I got a picture, finally. I don’t know if this changes anything about your prognosis. Sorry, the picture is a bit out of focus. Many thanks to the both of you for your helpful advice - there's so much to read and learn out there, you've really helped me put some of it together. However, I think I must have been unclear in my original email with regards to "salt": I didn't mean that I intend to add sodium chloride (NaCl) directly to the water, rather that in using calcium chloride (CaCl2) and sodium bicarbonate (NaHCO3) to raise calcium and alkalinity, the side effect of this is to introduce both sodium ions and chloride ions into the water. That said, I think commercial mixes are made by combining similar salts together, so they probably all add Na+ and Cl- to some degree depending on exactly what is inside them. ions, not 181mg/l - should have double-checked my calculations - oops. However it's probably well within the bounds of measurement and dosing error! that they would also make a significant contribution to osmotic/renal stress. I assume such stress is broadly why cardinals don't like harder water although I know very little about this in fish (my knowledge of physiology is mostly confined to humans!). so it would make sense for me to do the same at least to begin with. <Absolutely. If fish will breed in something, it's unlikely to be 'wrong' for long-term maintenance. While you certainly could acclimatise them to softer, more acidic conditions, I'd balance that against the extra costs. I will still add some sodium bicarbonate as my 50/50 mixes have 4-5 dKH after being left to stand, although as Neale was expecting, the pH isn't much different from standing tap water. Sorry to both you again (I feel I have driven you mad the last week!)!! Then driving back up to Manchester. Is there any other particularly good shops near any of these or on the route you can recommend? no eggs. I've scoured google and can't find an answer. has interest in her after the failed attempt at spawning and has started courting the other female in the tank. Have you seen this happen before? Some info on the pair: This is the first time either have ever attempted to spawn in their lifetimes - i.e. got them when they were small - they're new at this. They're about 4.5 inches (not including tail fins). Both are red spotted Severums. Do you think it's a size/maturity issue? Or maybe she's infertile? Sadly clownfish A died overnight. 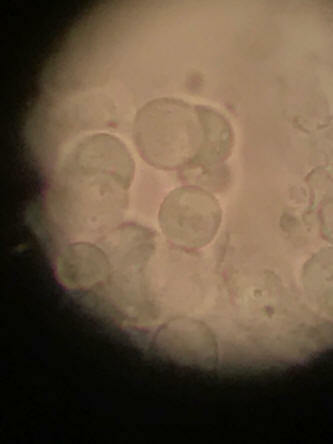 I did a more aggressive postmortem scraping and found these ciliates swimming around the sample. Do you think this looks more like Brook or Uronema? <Oh! I do think this looks like Brooklynella after all. and the linked FAQs below re others experiences. Hi, my LTA has been hiding under the rocks for about 2 weeks. He seems healthy. He ate my baby blue tang about a week ago. My question is should i try to move him out into the light? 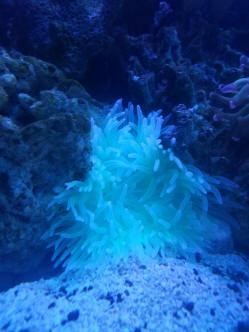 I have LED reef lights and actinic lights for backup. He has been in my tank for about 6 weeks total. I cannot reach him to feed him. The tank is 1 1/2 years old and very healthy. What are your thoughts? I have a garden pond app 6m x2m graded app1.5m to 25cm lightly stocked with marginal plants and only 10 gold fish, they feed well and are generally active but once or twice a day spend 15 to 20 minutes in a group in the turbulent water under the waterfall? WHY? <Most likely this is evidence of a lack of oxygen. There are tests for such if you're interested; perhaps an O2 meter you can borrow from a shop, or pond/koi club. I'd increase surface agitation; either by re-directing a pump/discharge to the surface, adding a "fountain" feature, or a mechanical airstone and pump (really like Tetra's "Luft" series here). Goldfish can live in pretty low/anoxic conditions but the stress isn't good for them. I am setting up a brackish water tank, currently it is 1.006 and I am slowly increasing it to 1.010 (the reason being that it is a mature freshwater tank and I don't want to kill all of the good freshwater bacteria by increasing the salt content all the way to 1.010 on day one). I am wondering, which of the 'marine' puffers will do OK in a brackish around 1.010? 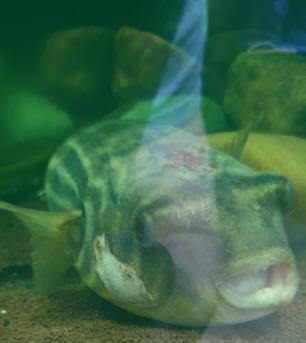 I understand dog faced puffers are OK? <Arothron hispidus will remain healthy for a long time in half-strength seawater. Whether indefinitely is hard to say. The species enters estuaries, and the juveniles live in them. But adults are really coastal marine, even reef fish. Not really river dwellers. So fun inmates for a brackish tank while young, but I'd probably move adults to marine tanks. Can a porcupine be kept in 1.010? - I am really keen on this one. If so can these two be kept together? is there any others you can recommend? <See above re: Chelonodon, a lovely, and actually quite sociable, species. It used to be very rare, but gets exported out of India fairly regularly. With the Arothron hispidus, could they be introduced whilst the salinity is still at 1.006 or best to wait until 1.010? <When I bought my two specimens, they were sold as freshwater fish! Do you have any suggestions where I can locate a Chelonodon patoca? None currently for sale at any of the regulars...wharf aquatics..wildwoods etc. <Wildwoods is where I've seen them at least twice. Keith Lambert at Wildwoods is pretty good at getting stuff if it's out there. 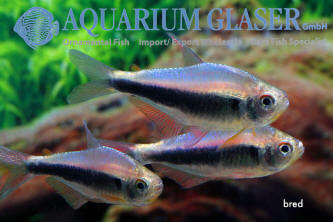 Aquarium Glaser has them on their (wholesale) stock lists so finding a store that works with them could be a start. Could either of these species be kept with a green spot or figure 8 puffer in a big enough tank? Thank you for your quick response. I have started dropping the salinity and stopped medicating. I also performed a scraping and examined it under the scope, but I’m not sure what I am seeing. I have included pictures that I took on 400x with a iPhone. They are terrible quality but I hoped that they might still be helpful for someone more knowledgeable. Just as an FYI regarding size, the photos only include a fraction of the actual field. Thank you for the book recommendation as well - I will be purchasing it shortly. Thank you again. I dropped the salinity to 1.010 but unfortunately both clowns look worse. Great to visit with you again at Aquashella! Just wanted to follow-up on our discussion of obtaining quality fish from Australia or net caught fish in general. As mentioned, trying to grab one of the Australian Copperbands (Chelmon rostratus) off of Diver’s Den is nearly impossible unless you hover over the keyboard pressing refresh like a woodpecker on crack, hi. Also looking for a good Yellow Pyramid (Hemitaurichthys polylepis). If you can hook me up with Kevin Kohen over at Live Aquaria that’d be most excellent! Regarding our discussion of quarantine, I’ve used FW dips for years followed by a 30-60 min bath in Sea Chem’s Paraguard (aldehyde based) before going in the QT for ~2-3 weeks. I’ve also used Methylene blue in the QT water and more recently started using PraziPro. Hopefully we’ll cross paths again at MACNA! Thank you Bob and great to virtually meet you Bill! Will be happy to have my team work with you directly to procure an Australian Copperband Butterflyfish and Yellow Pyramid. We have a few in house right now which are still in QT/Conditioning. I have cc'd my Manager Steve Krogh, Assistant Manager Patrick Largey (husbandry) and Admin Karen Fish who will be happy to work with you directly to accommodate your requests. Looking forward to working with you Bill and best wishes to all. <Ahh, the pleasure. Thank you Kev and team. I’m having a problem with Chester again. The problem he had with his open Gil in February has been resolved and has been doing great until the last few weeks. Chester became constipated because I over fed him. I fed him a variety of foods i.e.. Shrimp, bloodworms, pellets one time a day, but now I know I fed too much at a time. I keep him in a 5 gallon, heated, filtered, lightly planted, bare bottom tank so I can see when he’s pooped. The tank has been set up since 1/24/19. Since 3/15 he has been having the constipation problems. On 3/17 I added Epsom salt to his tank, which I left in the tank until I did A water change on 3/20. Since then I had fasted him a couple days and he’s pooped a few times. Over the last week I started feeding shrimp or pellets one day and frozen Daphnia the next. When ever I fed the Daphnia he would poop the next day, but would not poop on the other foods. Now he last pooped on this past Saturday 3/30 and I last fed him Daphnia On Sunday 3/31. So here we are. Now he’s not even pooping after the Daphnia and he hasn’t eaten for three days. I’m not sure what I should do next. Seems like fasting alone never makes him poop. Don’t know if I should add more Epsom salt. If so how much and how long. If I should fast him longer. I have Anubias in his tank too. Also I want to transfer him to a 10 gallon, as in my opinion the water chemistry is not that stable in a 5 gallon. I’ve lost the cycle a couple times. I’ve always kept Bettas in 10 gallon. Should I wait? I don’t want to stress him even more. I just added the plants to the tank 3/15 cause his fins had torn on the plastic plants. But all healed quickly though. So he’s gone through changes. He’s swimming around fine and always exploring and begging for food. He never had swim bladder problems. He is just a little bloated in front of his ventrals. Hi and thank you in advance for any help that you can offer. amount of white fuzz on Clownfish A's face (less than 1 square millimeter). I also noticed that A was breathing rapidly. Clownfish B and the RG had no apparent issues. My first concern was Brooklynella so I started treatment with Metro+ in the quarantine tank. I was also concerned about flukes so I also dosed PraziPro while heavily aerating the water. Day 2: I noticed increased white fuzz on Clownfish A's face. I did a freshwater dip (did not see any flukes) and dosed Metro+. 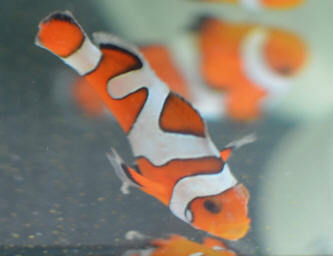 Day 3: The white fuzz on clownfish A’s face continued to spread and I also noticed that the tail fin looked ragged. I again dosed Metro+ and added Kanaplex given my concern for fin rot. Day 4: Clownfish B now had a small amount of similar white fuzz on its chin. 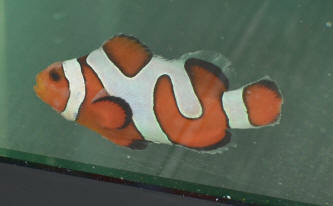 I also noticed a single white grain-of-salt-like lesion on Clownfish A (?ich). I thus decided to institute TTM and transferred them to a new tank following a 90 minute soak in Ruby Reef Rally (as I read that this could eliminate Brooklynella without formalin and I still thought the white fuzz looked most suspicious for Brook). I re-dosed metro+ and Kanaplex in the new tank. I also added Paraguard given my new concern for ich. Day 5: Clownfish A continued to look worse (more fuzz, rapid breathing) and had significant progression of fin rot from the day prior. Clownfish B was also developing more fuzz and ragged fins. The RG still looked healthy. I dosed Metroplex and added Furan-2 to broaden the antibiotic spectrum. I’m afraid I do not recall whether I dosed Paraguard. Day 6: I dosed Kanaplex and Furan-2. Again I cannot recall if I dosed Paraguard. The fish had no significant change from the day prior. Day 7: Both clowns had more white fuzz. Clown B’s fins also looked more ragged and it had developed a ~ 2mm shallow ulcer on its side. After another 90 min Ruby Reef Rally dip I did a 5 minute freshwater dip to look for flukes but made the mistake of tossing the water before examining it thoroughly. I then transferred them to a new tank and out of desperation redosed everything (Paraguard, Metroplex, Kanaplex and Furan-2). I should note that through the past week all fish have been swimming normally, not flashing, not fighting and eating LRS mixed with Selcon. The water tests 0 for ammonia and nitrite (but using the API test kits). The original tank did have a cycled bio filter but I have been using Microbacter, an air stone and a sponge filter in the subsequent tanks and transferring within 72 hrs. The temp is 78 F.
I have included some pictures of the clowns taken today. Unfortunately the white fuzz is difficult to capture clearly in a photo (but most prominent on the face). I am very confused as to what the actual diagnosis is and what to do next. I’m favoring a resistant form of Brook (especially as the RG seems unaffected) with superinfection (tail rot). But I’m also considering an atypical presentation of ich vs. Prazi-resistant flukes vs. Lymphocystis (but the fuzz is more of a thin film than a cauliflower-like growth) vs. something else entirely. Finally I worry that it could just be stress related and that all this polypharmacy, dipping and tank transferring is just making thing worse. I tried Chemiclean (http://boyd--enterprises.com/chemiclean/) out of desperation a couple months ago and it had no effect. It did kill my purple plating sponge though. Ugh, that hindsight : ( The black patches in my tank are rock-hard and can't be scraped off. 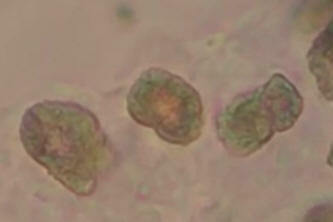 Are there boring types of Cyanobacteria, that might survive the Chemiclean? No, I don't use Coral Up. I thought about trying it, but some of the reviews said it wasn't any better than standard supplementation and patience. It couldn't hurt though, so I'll try that if the extra water changes don't make a difference. That along with hunting down a friend with a microscope or waving a white flag and using the dead coralline as an excuse to cover all my live rock with expensive corals. LOL. Thanks so much for your suggestions! Please share our newest paper with your community. It’s an interesting wildlife crime / illegal fishing focused paper. <Ahh, will do Andy. Thank you for sending this along. And i notice today it has discharge from mouth. Is my turtle dyeing? Sorry to add on, but something else I notice is bothering me... I don't think I was even sent the correct species. Once they settled in and I was able to get a better look at them. I would like a second opinion. I am attaching a couple of new pics with them colored up, as well as a stock photo of what I believe them to be. The first thing I noticed was that they have adipose fins. 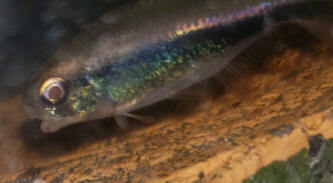 If I remember correctly Nematobrycon Palmeri (Emperor Tetra) don't have those fins at all? Or am I mixed up in my memory? I am sorry to bother you all with this but the farm still has not responded to any of my emails and I am in the process of going through my PayPal to request a refund as the farm (AZGardens) will not even attempt to work with me. If you agree that these fish are not the correct species that I ordered and paid for please let me know! <Your photographs are definitely NOT Nematobrycon palmeri; they do not seem to be Inpaichthys kerri either. Definitely something else. Whether precisely Hyphessobrycon margitae isn't something I'm quite so sure about. only be slightly below whatever the pH of the raw tap water was). That's terrible. Oh well I think my Hybrid cichlids are the GREATEST. <I have no idea what this is a response to! Glad you're enjoying your fish. Even If a Texas, Midas , red devil cichlid was healthy my hybrid would still win against them. This is propos to the greatest Hybrid cichlid of all time my (RED PHOENIX KING CICHLID ��) which over territory can THRASH a Texas cichlid, red devil, and Midas. It was a response to you saying you stated you don't like Hybrid cichlids. There's a guy there named Bob Fenner he said he also doesn't like hybrids. I have a eastern red spotted newt.. had him for months and he was thriving.. checked him today and his tail looks like its rotten or burnt not sure, i cant find anything on it and im freaking out please help! Thanks for getting back to me. For some reason your email ended up in my junk email, so I almost missed it. The PO4 is less than .03 ppm and the NO3 is less than 2 mg/L (using Salifert test kits). I can see a hint of colour on the higher sensitivity tests, but they're almost perfectly clear. How many weeks would you recommend performing the larger water changes, and would it be fine to break them up into biweekly 25% water changes? Im on here to tell you there will be 2 new EMPOROR cichlid aggression debates 1 my Hybrid (RED PHEONIX KING CICHLID��) aggression vs. the pure Texas cichlid aggression. Who do you think is more aggressive over territory. <Personally, I do not. If it were up to me I'd ensure they were always labeled as such and avoided by advising people that they're what they are. I just want to know do you like Hybrid cichlids. It's been some years since I last sent you an email about my reef tank on 23/04/15, (Bob replied). Unfortunately the tank proved too difficult for me to maintain consistently because of its smallish size (I wish I had the space to upgrade but unfortunately my house is too small) so I ended up breaking it down and switching back to freshwater. 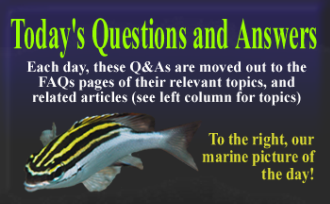 I am hoping one of you may be able to advise me on a few things relating to water chemistry and my plan for what I intend to be a planted tank with Cardinal tetras - I have done a fair amount of reading, but there are a lot of different opinions out there and I am kind of still in marine mode so I must admit I am a bit unsure if I am doing things right (or maybe over-complicating things). It is 82cm long, 56cm wide and 45cm deep, which is nominally 207L but accounting for the glass, sand, driftwood and not filling to the top, the amount of water in it is probably more like 160-170L. I have 2 Eheim Biopower 240s in it as well as a Vortech MP40 running at low speed - I think the nominal filter turnover is conservatively 560L/h and the Vortech adding another 500-1000L/h. Substrate is inert sand, I intend to fertilise with root tablets/clay balls and liquid fertiliser if necessary. Lighting 2x Fluval Plant 3.0 32w. I am not intending to run CO2 at the moment but I may start to do so once I have the tank settled. It is currently cycling so it is uninhabited. My plan for the tank is to have Cardinal tetras only (as a species tank) and at least a decent amount of plant life (I am not going to choose plants until I have the water chemistry sorted). pH: around 7.3-7.6 on my meter. Would I be right in thinking this water is far too polluted with phosphate for me to use for water changes, even diluted with RO? 2) Assuming the tap water isn't suitable, I was intending to use RO water hardened up using individual salts, i.e. sodium bicarbonate, magnesium sulfate, calcium chloride and potassium chloride in the appropriate ratio to make it up to the correct hardness. It seems to me this is no different to what I used to do with my reef tank and I have seen postings on forums describing methods that sound like this, but could I check whether you agree it is reasonable? 3) I understand I have to balance the Cardinals' preference for softer water with providing enough minerals for the plants and general buffering. This makes the total general hardness (Ca and Mg): 50mg/l = 8 dGH and the Ca:Mg:K mass ratio 4 : 1 : 0.5. Theoretically using the individual salts I mentioned above this would make the TDS about 460mg/l, of which about 181mg/l would be Na and Cl ions. Is this a reasonable compromise, i.e. soft enough in terms of GH for the Cardinals but with enough carbonate for a decent buffer? What about the absolute levels of Mg and K - do you think these will be high enough for the plants or should I increase these or otherwise alter the ratio? 4) I have read that having too much NaCl is not ideal in most FW tanks but I can't find much about what is considered a "safe" level. 181mg/l sounds quite high though particularly for soft water (our water company estimates our tap water has 120mg/l), any thoughts about this? I have considered substituting in some NaCl-free marine salt into my recipe to reduce the NaCl burden but I don't know if this would result in adding too much of the trace elements - what do you think? 5) Assuming I manage to get the water chemistry right and things stable, how many Cardinals do you think could live in this tank comfortably? 6) Is the flow rate too high? It's enough to cause a bit of turbulence in places but not enough to lift or move the sand. I have 5 baby red eared slider turtles they were good but one of my turtle stop eating and it is not moving much. (1) What source of heat do they have? (2) What sort of UV-B lamp are you using? (3) What do you feed them? (4) How big is their tank? (5) Can they bask under the heat lamp easily? Same for the UV-B lamp? Thank you for responding so promptly! I honestly hadn't even thought about asking for a refund as they arrived alive. I will definitely look into that as its always a bit more costly ordering fish directly. Unfortunately we have no quality pet stores in my area, just a Petco and you couldn't pay me to take home anything they have. That said, a birth defect or possible injury from fighting is actually a relief to hear considering the other possibilities. I wanted to find out as much as possible as soon as possible as some things are so time sensitive when it comes to most fish illnesses. Aside from this they appear to be healthy. Thank you again for your time and response. We really do rely so much on this site and all of you when it comes to our aquatic hobby. Sorry about the lengthy messages. Thank you again! This Ritesh from Long Beach. Hope you are well. I was searching your website for articles in regards to curing, but I wasn't coming up with what I was looking for. I have only found one video on YouTube that had relevant information. Because it stated that for wild wood to be considered aquarium wood it would have to have been petrified in the wild. I have collected some Orchid Tree twigs and a few seed pods without seeds. I boiled the heck out of it. Wash it. Sprayed it down with hydrogen peroxide. The amount of twigs is about a hand full. And they were dry twigs that died from the tree already. Same as the pods. Is there a real method to curing the exact type [dead twigs] and amount of the Orchid Tree? A long version and a short version? I am coming to you with a question and hopefully a possible diagnosis for what is going on with these guys. I recently received 6 Nematobrycon from a fish farm that is usually reputable so I will keep their name to myself for now. I Ordered these guys a few weeks ago but they were just sent this week. I got them unpacked and into the quarantine tank when I noticed that 4 of the six had strange looking (bumps/growth?) on their chin area sizes of the growths vary from fish to fish. Not sure if it is some kind of birth defect, tumor or parasite possibly? It doesn't look like fungus to me, not cotton like or hairy. More like a growth/tumor of some kind. I did message the farm about it within minutes of getting them sorted in the tank for inspection. That was yesterday morning and I have not heard back from them as of yet (possibly due to the weekend) so I have been looking online for any kind of answers. I have come up with nothing. I can send my tank info if needed I just didn't think it was relevant considering this particular situation. I am including the best pics I could manage to get as they are quick little things. Some of them are eating but not all of them. <If they're feeding, then a non-lethal birth defect may be the case here. I do not want to just start dumping meds into the water unless needed. Filter is only a couple weeks old. I know not to change everything all at once. Is he dying? I think I'll die if he does. but he has been fine, until now. His belly goes from white to black, and he is staying at the top of the tank at a vertical angle. Or stays with his beak pushed into a corner of the tank. But the last 3 days he has not been to the bottom at all and is being tossed around or flipping around like an acrobat & I know that's not normal. I just did a 60 percent water change. I know nothing about snails, I looked around on the website and I found the snail ID page but no info on helping me figure out what type of snail this is. The eggs were orange/pink/yellow, I disinfected the plants using a bleach dip and I soaked them all overnight before adding to my currently cycling tank. I was not expecting snails because of the bleach as well as all eggs I saw were thrown out. I’m happy with snails I just need to know what type it is so I don’t accidentally kill it. It has a brown shell but some of it is clear. Is it too soon to identify? 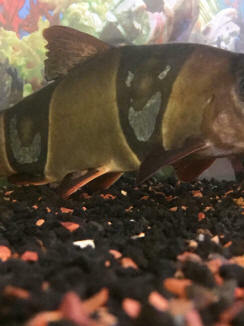 I own one clown loach that has been living in my aquarium for the past 20yrs. Two month ago we relocated to a new house. I abandoned my old aquarium of 350L and got a smaller one of 180L due to space restrictions. All the fish are fine and had no issues until last week. 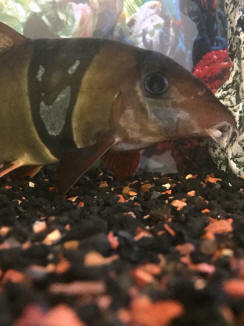 I started noticing that the clown loach behavior is not as usual, not eating and losing his colors pigmentation on his body and fins. I don't want to lose it after such a long time. <My instinctive reaction here is something like Hexamita, or some other protozoan infection similar to Hole In The Head disease as seen in cichlids. That being the case, a combination of Metronidazole alongside an antibiotic (Nitrofurans are often recommended) would be the usual treatment. Any such treatment would need to be alongside optimising living conditions. The smaller size of your tank could easily be the problem here. Hi Bob, attached is part 2 of the guide. Can't get enough of that funky WWM stuff? Set-Up 1: Types of Systems:, Gear/Components:, Set-Up, Tanks, Stands, Covers:, Water, Seawater, Substrates, DSBs, Electricity, Heating/Chilling, Aquascaping, Biotopes, Travelogues. Set-Up 2: Filtration of All Sorts, Skimmers, Sumps, Refugiums, Plumbing, Circulation, Pumps, Powerheads, Aeration & Light/Lighting:. Site Navigation-The navigation through the site is designed to allow you to go through the pages following the blue links to get to the information you seek.